We learned more about Scaled agile framework in our last tutorial. With this online quiz, we have come to the end of our series on Agile and Scrum Methodology. The series may be one of the most in-depth and practical works on Agile that you would find over the internet. However, Agile as a topic in itself is boundless and never-ending. The more you practice Agile, the more you will imbibe and master it. We have developed an online quiz for you to practice the exercise and test your knowledge on Agile. So go ahead and take the test. Important Note: If you haven’t already read the tutorials on Agile, the recommendation is to first read the tutorials and then take an attempt at the quiz for best results. The time limit for the quiz is 10 minutes. The quiz is comprised of 20 questions. The quiz is a multiple choice question paper where a question can have more than one correct answer. For every correct answer, you can score 1 mark. Q #1) Which of the following is delivered at the end of the Sprint? The output of every Sprint is an Increment of a Done Software which can be shipped off to the end user for usage. An item is only marked done if it matches the definition of done. Q #2) Product Backlog should be ordered on the basis of? Product Backlog is ordered on the basis of the value they provide to the business. The value may be influenced by several other factors like risk, complexity, and criticality but are not the direct basis for calculating the Value. The value of the item being delivered is calculated by the Product Owner and he is the one who is responsible for ordering the Product Backlog. Q #3) In an Agile environment, what is the main responsibility of a tester? In a Scrum Team, there are only three roles: Scrum Master, Product Owner, and the Development Team. No other role is allowed and there is no exception to this rule. One of the Development Team’s member may be more inclined towards testing and has Tested as the area of expertise but he would still be called a Developer. Q #4) When is a Sprint Retrospective ceremony performed? In Scrum, it is mandatory to conduct all the Scrum ceremonies including Sprint Retrospective. Sprint Retrospective is a meeting where all the team members sit and retrospect from their current sprint and lay out the action items to improvise for the upcoming sprints. For the very same reason, Sprint Retrospective is conducted at the end of each Sprint. Q #5) When can a Sprint be canceled? The power to cancel the Sprint lies only with the Product Owner. He/She can call to cancel an ongoing Sprint when the Sprint Items are no longer required by the business i.e. the items have become obsolete. Q #6) What should a Development Team do during a Sprint Planning meeting when they have realized that they have selected more than the items they can complete in a Sprint? As we are still in the Sprint Planning meeting i.e. haven’t started the Sprint yet, the developers are free to make changes to the Sprint Backlog items. They can choose to remove some of the items which they think that cannot be completed with the current Development Team’s capacity. Note that addition or removal should always be done in consensus with the Product Owner as he is the one who decides on the Priority of these items. The removal is not allowed once the Sprint has started. Q #7) Who is responsible to measure the Project’s performance? Being the customer’s voice, it is the Product Owner’s responsibility to measure the Project’s and Release performance and see if the team is on track to complete the project on time. Q #8) What are the main responsibilities of a self-organizing development team? The main responsibility of a self-organizing team is to estimate the product backlog items (also known as story pointing exercise), pull them from the top of the Product Backlog, and break them down into multiple tasks that can be assigned to the individuals in a team and finally developing them. Q #9) What does a BurnDown Chart display? A burndown chart represents the amount of remaining work with respect to the time. The horizontal axis represents time whereas the vertical axis represents the amount of work remaining. The burndown chart is one of the several metrics that is used in Scrum to project the completion date of the project given the product backlog, team’s capacity and team’s velocity remains the same. Q #10) What are the main responsibilities of a Scrum Master? Scrum Master is the person who is responsible for facilitating/coaching the Development Team and the Product Owner to work on the day to day development activities. He is the one who ensures that the team understands the Scrum Values and Principles and is able to practice them. At the same time, Scrum Master also assures that the Team feels enthusiastic about Agile in order to achieve the best out of the framework. Scrum Master also helps and supports the team to become self-organized and removes impediment for them. Q #11) In Scrum, when is a Sprint Over? All the Sprint activities are time boxed including Sprint. Unlike other Sprint activities, Sprint can neither be extended nor shortened. If for instance, all the items of a Sprint are not completed, the Sprint is still marked over and the remaining item(s) is moved to the Product Backlog from where it can be scheduled to any of the subsequent sprint based on the revised priority. Similarly, the Sprint can never be shortened. If all the Sprint items are completed before time, the development team is free to pull in the top Product Backlog items and start the development. Q #12) What is the significance of determining a Definition of Done? e. Develops a common understanding amongst all the team members as to what all needs to be completed to mark every item complete. The ideology behind creating a Definition of Done is to have a set of checklist which is common to all the Sprint Items and determines everything that needs to be done in order to complete a backlog item. Having a Definition of Done will build a common understanding amongst everyone in the team as to what all needs to be done. It will allow everyone to understand what it means when a Development Team says something is complete. That is the kind of transparency the Definition of Done brings in. The Definition of done also serves the purpose in a sense that the Development can now think and plan better as they know what is expected from a particular work item. Q #13) What is done during a Sprint Review Meeting? The Sprint Review Meeting is conducted to demonstrate the Sprint Increment to the Stakeholders and the Customers. Another very important task in the Sprint Review Meeting is to demonstrate the Project’s performance to the Stakeholders. The Development Team is responsible to demonstrate the Increment whereas the Product Owner is responsible to demonstrate the Project’s performance. The stakeholders and the customers are open to provide feedback which is then incorporated by the team. Q #14) What is a Sprint Review? Sprint Planning, Daily Scrum, Sprint Review and Sprint Retrospective all the four ceremonies in Scrum are opportunities for inspection and adaptation. During a Sprint Review, the idea is to inspect and seek feedback from the stakeholders and adapt them. Q #15) What do we mean by a cross-functional Development Team? Cross-Functional Scrum Teams are the teams having all the necessary skills and proficiency within the team to accomplish their work. These teams do not rely on anyone outside the team for completing the work items. Thus, the Scrum Team is a very creative amalgamation of different skills required to complete the entire work item. Each team member may not necessarily have all the skills required to build the product but is competent in his/her area of expertise. Having said that, the team member need not be cross-functional but the team as a whole has to be. Q #16) Who should necessarily attend the Daily Standup meeting? The Development Team is necessarily required to attend the Daily Standup meeting every day. Anyone else who wishes to attend the meeting is very much welcome but it is not mandatory to attend it. Other than the Development Team, whoever is attending the meeting is not allowed to give updates or participate. He can enjoy listening while others are participating. The Scrum Master though can attend the meeting and also facilitate it if he has been requested for the same by the Development Team. Even the stakeholders can attend the Daily Standup meetings. Q #17) What happens when all the Sprint Items cannot be completed? In a case where the team is unable to complete all the Sprint Backlog items, nothing happens. The Sprint ends on the stipulated date with the completed items. The Development Team demonstrates the completed items in the Sprint Review meeting. The uncompleted items are moved back to the Product Backlog and are again prioritized from there. Q #18) What should be the size of the Development Team? The ideal and recommended development team size should be 6+-3. Development Team size should be chosen very wisely as it can directly hamper the productivity of the team thereby impacting the product delivery. The Development Team should not be very large as it might require a lot of coordination amongst the team members. However, for a very small team, it would be very difficult to have all the skills required to deliver an Increment. Thus, an optimal number should be chosen for the Development Team Size. Q #19) What activities are a part of Product Backlog Refinement? Product Backlog Refinement is an activity where the entire team sits together and brainstorm around the backlog items. The backlog items are refined and the details are added to them. During the meeting, the Product Backlog items are ordered based on their priority. Once the Product Backlog items have been refined, the Development Team members estimate the Product Backlog Items. Q #20) Which of the following activity is not timeboxed? In Scrum, all the ceremonies are time boxed i.e. they cannot be extended. Except for Sprint, others can neither be shortened. Product Backlog Refinement is one such meeting that is not timeboxed rather is a continuous process and can be conducted whenever the team wants. Note that the team shouldn’t spend too much of their time in Backlog Refinement Meeting. 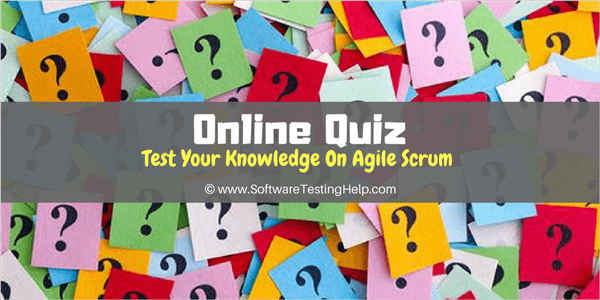 Check your Agile Scrum Quiz Test scores to evaluate your understanding! Hope you enjoyed the wide range of tutorials in this Agile series and we are sure that this will be the best guide on Agile for anyone who wants to learn more on Agile! !